We are told in his book that the prophet Hosea was the son of Beeri and came from the northern kingdom. According to the prologue of his book he was active during the reigns of Uzziah (787-736 B.C. ), Jotham (756-741), Ahaz (741-725) and Hezekiah (725-697), kings of Judah, and during the reign of Jeroboam II, son of Jehoash, (787-747) king of Israel. His preaching ministry seems to have been in the 8th century, after Amos and before Isaiah. Despite the fact that the kingdom was enjoying a period of prosperity and material affluence, its religious life was in crisis due to the introduction of foreign gods. The priests of the time performed their duties in a purely professional manner, promoting the worship of Baal, against which prophets of the 8th century railed, Hosea among them. In the first three chapters of his book, which consists of fourteen in all, Hosea sets out his personal drama, that is his marriage to a harlot, a marriage which is of allegorical significance and constitutes the main section of the prophet’s book. At God’s command, Hosea took to wife Gomer, the daughter of Diblaim, and fathered two sons and a daughter by her. However, because his wife was unfaithful, Hosea cast her out, once he had discovered her indiscretions. But then, again in accordance with a new commandment from God, he took her back, after she had genuinely repented. Theophylact of Bulgaria is of the opinion that God’s directive to Hosea to take a harlot for a wife is a sign indicating Israel’s fornication against Him and that He was willing to tolerate for a time the people’s infidelity until they repented and returned to the worship of the only true God (P.G. 126, 577). According to Theodoret of Cyrus, idolatry is what is meant by harlotry, as regards the relationship between God and the people. Israel is compared to a harlot, soundly rebuked. In this instance, however, it is not the Israelite people who are rebuked, but the land of Israel itself, because, in Hebrew thought, a country was not merely the territorial extent or material size, but the living force which encompasses the land and its inhabitants. Cyril of Alexandria comments that the land of Israel fornicated by setting aside the testament it had contracted with God, that is, the observance of His commandments (P.G. 71, 36). This apostasy was the main theme of Hosea’s prophecy, in which he foretells the punishment of the people and the demonstration of God’s love towards them when Israel repents. God’s punishment and love of Israel are symbolized allegorically in the book of Hosea by the marital relations of the prophet with the adulteress, a relationship which greatly influenced his teaching. In verse 11:1 (“When Israel was an infant, I loved him, and out of Egypt I called his children”) [Septuagint] presents this relationship as being even closer, not merely as a relationship between spouses, but something more: A relationship between father and son. God the Father called his son when he was still imprisoned (as a child) in Egypt and led him into the wilderness. There the people had the experience of the extended presence of God, Who appeared on Mount Sinai (Ex. 19), with wonderful signs and, when the people were terrified at His presence, He gave the law to Moses. The manifestation of God, the covenant and the transmission of the law are the most significant events in this relationship. Hosea recalls memories from the people’s wandering in the desert, because he declares that this was the golden age for the Israelite religion, when God continually revealed Himself to His people. This revelation and relationship was reconstructed by Hosea as the relationship between the spouses in married life. Religious syncretism and the departure of the people from the observance of God’s commandments were pure adultery, as far as Hosea was concerned. The golden age in the desert, when Israel recognized the true God and remained faithful to His will had passed and syncretism had usurped its place. The God of love did not immediately sever the ties with His people, however, but left room for repentance, return and restitution. This relationship between God and the people was of particular significance because it promoted monotheism as the only path to salvation. In the book of Hosea, God is not merely just, who judges and punishes His people, but is also full of love. He punishes, but also calls to repentance and forgives. 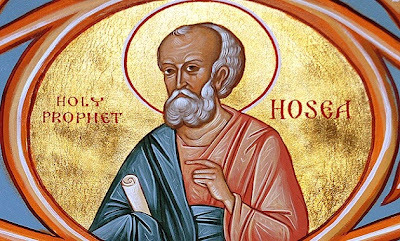 Hosea is called the prophet of love, in the same way that Saint John is called the Evangelist of love.